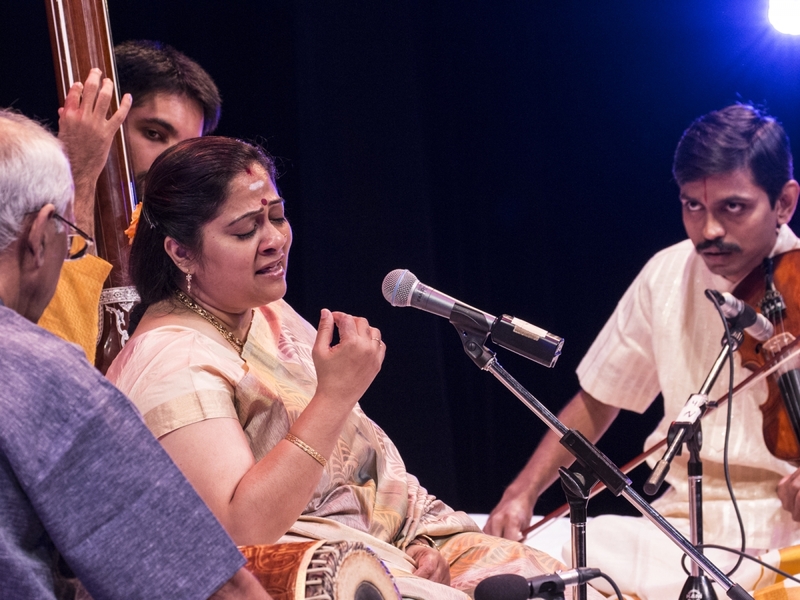 But for the mridangam (Neyveli R. Narayanan) it was an all-woman ensemble as Sowmya took the stage on Christmas Eve! Narmada was on the violin and Bhagayalakshmi Krishna on the morsing. 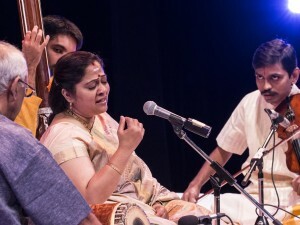 Sowmya’s opening for the concert was th Saveri Adi tala varnam Sarasuda of Kothavasal Venkataramayya. The pallavi, anupallavi, and mukthayi swaram were presented in two speeds and the charanam onwards in a fast single speed as commonly done. ‘Nadadina,’ (Janaranjani, Misra Chapu) of Tyagaraja came with a brief alapana of the ragam. The phrasing ‘ri ga ma ri sa’ is indicative of Poornachandrika, a very close ragam. In Janaranjani this should be eschewed and instead ‘ga ma pa ma ree’ be used to avoid any identity crisis. The opening words of the charanam were taken up for niraval and kalpanaswaras. Being Somavara (Monday), the day’s vara kriti of Muthuswami Dikshitar, ‘Chandrambhaja Manasa,’ (Asaveri, Matthya talam was sung. A Kalyani ragam, Adi talam kriti of Ghanam Krishniyer, ‘Paarengum Parthalum’ was rendered next. The texture of the piece was suggestive of a padam/javali and was rather a misfit in the earlier part of the concert. Sowmya could have it pushed to the post-pallavi part. After an alapana of Kedaram, a Misra Chapu kriti, Ananda Natana Prakasam, the Akasalinga kriti of Muthuswami Dikshitar was presented with kalpanaswaras at Kedareswaram. Again the ‘sa sa ri ri ga’ jhanta prayogam seemed out of place. Up to this point, the concert ambled at a sedate gait. Sowmya brought in tempo by presenting a pacy ‘Manasuloni Marmamu’ (Tyagaraja, Varamu, Adi). It did achieve the effect of making the audience sit up. The mood being achieved Sowmya took up Madhyamavati for alapana with ‘Palinsu Kamakshi’ of Syama Sastri in Adi talam. Thani avarthanam by Narayanan and Bhagyalaksmi was creditably done. 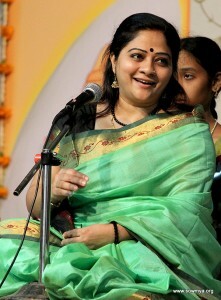 Sarasangi was the Ragam Tanam Pallavi choice of Sowmya. 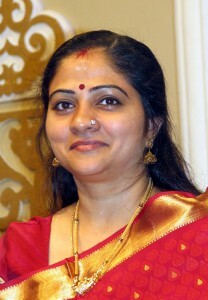 The words of the pallavi — ‘Sarasangikadhyutha Pathe Natana Pathe Sivakama Valli Pathe Sada Namasthe’ set in Khanda Jathi Ata talam. Rendered with all the due features, the pallavi had a ragamalika kalpanaswara embellishment. The ragams were Kanakangi, Latangi, Swarnangi, Rathnangi, and Shyamalangi. As a forerunner of ‘Krishna Nee Begane’ in Yamuna Kalyani, Misra Chapu talam a Kannada couplet was rendered in Sindu Bhairavi and Yamuna Kalyani. 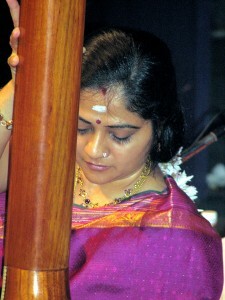 The closing piece of the concert was ‘Chidambaram Pogamal Iruppeno’ in Chenchurutti. Narmada’s violin support in solo versions was well presented, enhancing the concert. The percussion support was neat. This entry was posted in Concerts on January 21, 2008 by sowmya.